The use of the pulse plasma sintering technique for CoSb3 thermoelectric material consolidation is reported in this work. The influence of sintering temperature on the microstructure and material properties such as the Seebeck coefficient, electrical resistivity, and thermal conductivity has been investigated. It is shown that, for samples fabricated at 923 K and 973 K, there were no significant differences in the average grain size or final phase composition. 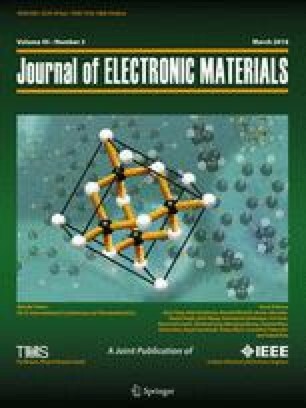 In both cases, a fine-grained polycrystalline structure of the compacts with density nearly equal to the theoretical value was achieved. Both samples were composed almost uniquely of CoSb3 phase. The measured thermoelectric parameters such as the Seebeck coefficient, electrical, and thermal conductivity showed similar dependence on temperature. For both samples, the Seebeck coefficient was negative at room temperature and showed a transition from n- to p-type conduction over the temperature range of 400 K to 460 K. The measured minimum thermal conductivity values, 4 W m−1 K−1 to 5 W m−1 K−1 at 723 K, are typical for undoped bulk CoSb3. A maximum ZT value of 0.08 at 623 K was obtained for the sample consolidated at 923 K for 5 min. The results of this work are very promising from the point of view of use of pulse plasma sintering as an alternative method for fabrication of a broad range of thermoelectric materials in the future.